What causes of irrational behaviour? We’re all guilty of acting irrationally sometimes however level headed we think we are, and sometimes despite knowing it’s irrational we just can’t help ourselves, so why do we do it? We have three minds in our brain, the reptilian, the mammalian (primitive) brain and our uniquely human intellect. The reptilian brain controls the body’s vital functions such as heart rate, breathing, body temperature and balance, the mammalian or primitive brain (otherwise known as the Limbic system) which is involved in motivation, emotion, learning, memory and significantly our flight/fight response and the intellect does what it says on the tin – it’s our clever bit. 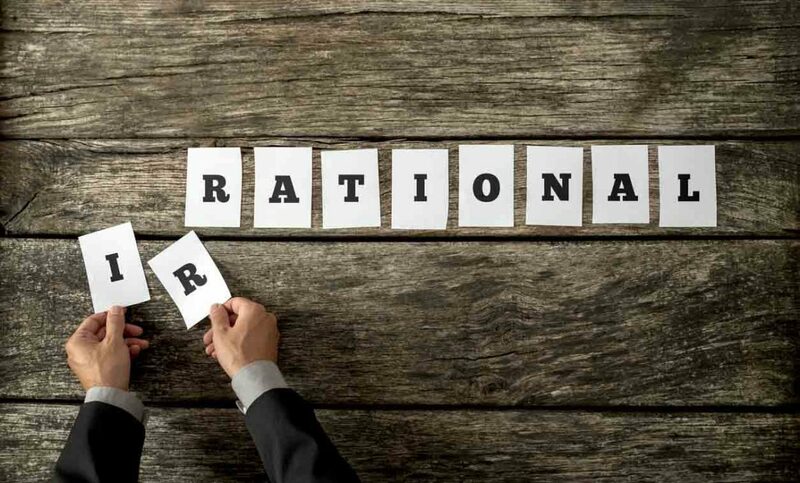 When we’re thinking rationally we’re operating from our intellectual mind, it assesses the situation and comes up with answers based on facts not emotions, but as anxiety or stress rises, we start to lose intellectual control and our emotional, flight/fight part of our brain steps in and takes control. This part of our brain, although vital for survival, reacts to situations rather than thinking them through logically and can make us think or behave in an irrational way. So the question is, what makes our anxiety and stress levels rise? It’s not events in our lives that cause anxiety to rise, it is the way we think about those events or situations and the primitive flight/fight part think in a negative way, either negatively forecasting the future (worrying and what if-ing) or negatively introspecting about ourselves, our lives and our past. The more we do this negative thinking about things, the more anxiety levels rise, but sometimes it can happen in a split second. In an instant we can flip from being calm and level headed to thinking or acting emotionally and irrationally if something triggers a previously formed behaviour pattern in the hippocampus (memory centre of the limbic system) and it’s this type of irrational behaviour I want to focus on now, but lets take a step back and talk about pattern matching first. Pattern Matching is one of the reasons we are so successful as a species, it’s the ability to instantly assess something we haven’t come across before and decide on a response or course of action. It’s like playing a very complex game of ‘snap’ in our head constantly and the cards in our pack are added to constantly as we grow up and learn. The pack of snap cards includes information from all our senses, hearing, smell, sight, touch and is stored in the hippocampus. What would a small child do? This is clearly very useful in dangerous situations and as we get older and wiser we are more able to make a pretty accurate assessment of what to do with something new – do we eat it, sit on it or run away? A baby is more likely to try and eat new items than run away, they are at very early stages of building the pack of snap cards and until they have learned about danger, food is essential and instinctive for survival. But, this ability to pattern match is flawed and can also give us the wrong information based on something it has matched in the past. These snap cards are the triggers, put a few of them together and you’ve got a pattern to match with something or an experience in YOUR past. Triggers are something which accesses a memory and that memory will have attributes linked to it and everyone’s attributes will be different depending on their own experiences. Everyone has different experiences, different patterns and will have no idea what yours are. Do you like porridge – Why or why not? A friend of mine hates porridge because the texture of it reminds him of being forced to sit at the table and finish his rice pudding as a kid – unhappy times! His brain has decided that porridge isn’t nice because an experience with something of a similar texture wasn’t. Fairly harmless. Where these triggers and pattern matching abilities can steer us in the wrong direction is when something triggers a memory and we then use our imagination to forecast the future based on that past. Just because something is similar to a past experience, it doesn’t necessarily follow that the experience in the future will be the same. Many people have dental phobias – those people could have had a bad or traumatic experience as a child or picked up on a parental fear and developed a trigger which matches a behaviour pattern to ‘stay away from dentists because they hurt or make us upset’. Intellectually we know that dentists are not bad or every experience will hurt, but our defence mechanism, the Amygdala (the part responsible for the flight/fight) will automatically steer us away from repeating something which was unpleasant the first time around. Have you ever been to a restaurant and had a bad meal or even worse food poisoning? Did you decide to never go there again? – probably. Does it mean that everyone who goes there will always get food poisoning or have a bad meal? – probably not. But what if this creeps into personal relationships with people? Is it appropriate to judge a person based on an experience with someone else because a certain trigger reminds you of an emotion you would rather not repeat. What if you start a new job and your new boss looks similar in some way to an ex partner who turned out to be particularly unpleasant or unkind to you, do you judge your new boss and decide your experience is going to be the same as with that ex partner? – rationally, of course not, but the part of your brain which makes the assessment when something unpleasant is triggered, especially if it’s an emotion or fear, reacts before reason prevails. What do you do if, at the start a new relationship, that person says or does something which triggers an unpleasant relationship memory from the past – does it mean that the relationship is going to be the same or that person is in any way the same as the previous one? Maybe your imagination fills in the blanks and forecast a negative outcome based on 1 trigger? Maybe it’s right to do so? The point is we don’t know, our imagination decides for us and sometimes it’s not helpful. We will have hundreds and thousands of these conscious and unconscious behaviour patterns based on triggers and pattern matching and developed on past experiences and mostly helpful and designed to keep us out of harms way. We will also have behaviour patterns based on pleasant outcomes or ‘rewards’ in the form of feel good neurotransmitters such as serotonin or dopamine which we are actively encouraged to repeat because it serves us in a positive way. But sometimes we develop unwanted patterns of behaviours or behaviours which affect people around us based on misinformation or partial patterns that our imagination is adding to inappropriately. 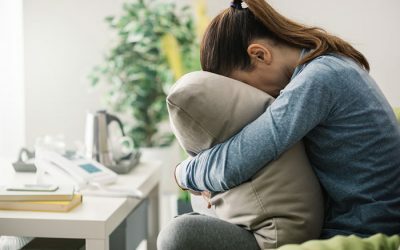 Hypnotherapy can help people with specific fears and phobias and those who have developed trigger or response behaviours which are not helpful in their every day life or are causing them to avoid situations or maybe following the same patterns of behaviour time and time again which are not positive for them or people close to them. If someone is acting irrationally in your life, perhaps you can step back and think of it objectively and help them to figure out what triggered the behaviour, sometimes it’s as simple as understanding the association that can begin to diffuse it. Many people have dental phobias and hate the dentist (you’ve got to feel sorry for all the irrational animosity dentists receive) – those people could have had a bad or traumatic experience as a child or picked up on a parental fear and developed a trigger which matches a behaviour pattern to ‘stay away from dentists because they hurt or make us upset’. Intellectually we know that dentists are not bad or every experience will hurt, but our defence mechanism, the Amygdala, will automatically steer us away from repeating something which was unpleasant the first time around. At Old Town Hypnotherapy we help people with fears and phobias and those who have developed trigger or response behaviours which are not helpful in their every day life or are causing them to avoid situations or maybe following the same patterns of behaviour time and time again which are not positive for them or people close to them.